BetOnline.ag and PokerForums.org Giveaway $208 worth of buy-ins. PokerForums.org is back online and would like to thank forum members for their patients by giving every forum member $208 worth in tournament tickets for returning. We aren’t asking forum member to jump through hoops to claim the tournament tickets: 2 in total, all we are asking is member sign up to BetOnline Poker using this LINK: CLICK HERE! This is because you need to be tracked to PokerForums.org to claim the tickets and also have an account at BetOnline as this is where the tickets will be redeemable. After you have signed up and deposited (you must min deposit), Deposits will also be eligible for a exclusive 200% deposit bonus which will be triggered with the tournament tickets. This can take 24/48hrs. You then have to comment below with BetOnline user number. Which will look something like this: (B1916789). The Tournament Tickets that you will receive are for the 2 biggest tournaments on BetOnline. 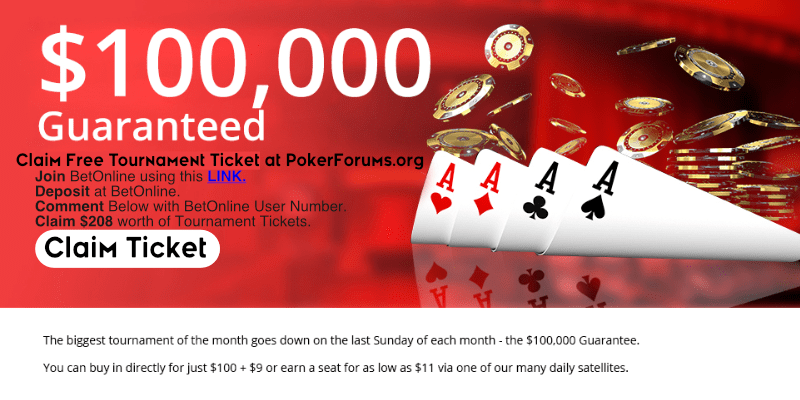 The Sunday night $50,000 Guaranteed which is worth $90+$9, and the end of month Sunday $100,000 Guaranteed which is worth $100+$9. Join BetOnline using this LINK. Comment Below with BetOnline User Number. Claim $208 worth of Tournament Tickets. Remember: You must use the links in this post to be tracked to PokerForums.org to claim these Tickets.